How DROBO Works, How Storage Device Works, Drobo Inc. Simply expand storage at any time. 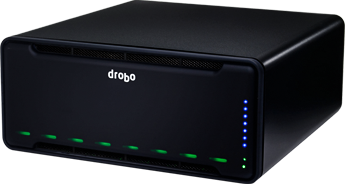 Drobo stores up to 128TB, using any combination of 3.5" or 2.5” disk drives. The Drobo family offers ThunderboltTM 3, USB 3.0 Type C, Ethernet, iSCSI, and other connectivity options, providing the data protection you need, along with the speed and interface you want. Drobo takes upgradability to the next level. Not only can you upgrade capacity with no downtime by adding new drives or replacing smaller drives with larger ones, you can seamlessly upgrade to a new Drobo by simply removing the disk pack from your current system, and moving it to a new Drobo. Upgrading not only gives you an instant performance boost, but also delivers all the other benefits of the new Drobo. When buying drives for traditional storage, you’re forced to struggle with screws and clips. The smart, simple Drobo changes all of this. Insertion and removal of drives in a Drobo can be done while it is powered on and in use, making it easy to replace a failed drive or scale up when you need more capacity – all with zero downtime. 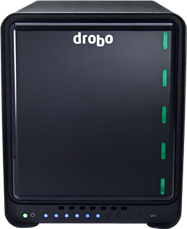 Every Drobo has a unique carrier-less design. Just insert bare 3.5″ or 2.5″ drives the same way you would insert cassettes into a tape deck. No drive carriers or screws necessary. The industrial design and simple user interface on Drobo takes ease-of-use to another level. Drobos are expertly crafted from the ground up with high-quality materials. One incredible Drobo innovation is its carrier-less drive bays and magnetic front bezel. Just pop drives into the front of the Drobo to increase capacity or place the bezel on the front of your Drobo and it automatically aligns and secures itself. Drobo fans are variable speed and only spin fast (make noise) when the system needs more cooling. The high-intensity indicator lights shine through the bezel and give you a visual status of your Drobo. Desktop models can be dimmed for comfort in a home or office environment. Drobo Dashboard makes everything easy to install, manage and maintain. 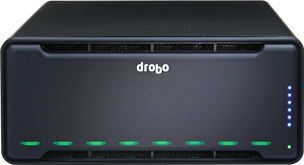 And, let’s face it: Drobo looks cool. So whether it’s sitting on your desk or in your datacenter, Drobo always looks great while protecting everything that’s important to you. For more details about our incredible design and user interface innovations, and other Drobo technologies, check out the BeyondRAID White Paper.